Why I like it Wednesday goes along with the Rejection - Brush Off idea. It is the company and paint brushes I order from. 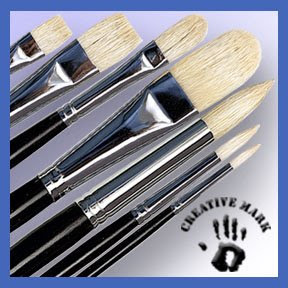 I buy cheap paint brushes, (Creative Mark Pro-Stroke White Bristle Brushes) well, no paint brushes are cheap but I buy the least expensive ones. When painting I will sometimes get called away from my work doing something for the kids, home, or whatever. I will leave my paint brushes, thinking that I'll only be a minute, only to come back later or the next day to find that they have dried paint in them from when I left. GRRRR!! So I don't need expensive brushes to ruin, I can ruin the cheaper ones. Don't get me wrong they still are very serviceable and the filbert (flat with tapered edges) brushes are my favorite. ASW is an online company I order from with reasonable prices and a good selection. And I can order in the middle of the night. That's Why I Like It.